MicroLED is the latest in he emerging display technologies .Starting from CRT, through LCD,LED ,OLED and mLED, display technology is evolving at higher speed. 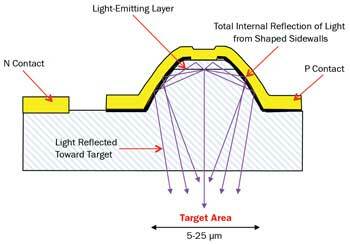 mLED displays consist of arrays of microscopic LEDs forming the individual pixel elements. It has got lot of advantages over other existing display technologies. Micro LED was first realised by in the year 2000 by a research group run by Prof. Hongxing Jiang and Prof. Jingyu Lin of the Texas Tech University. Let us recall the basic structure of LED display. LED displays are used in large displays like leaderboards,advertising pannels etcc. LED TVs and Smartphones displays are usually LCD with LED back-light. Usually consumers think that LED TVs have LED display. It is LED backlit LCD. But, OLED and micro-LED ae self illuminating. In an OLED(Organic Light Emitting Diode), a thin layer of organic material is placed between two conductors, which is then used to produce light when a current is applied.At least one of these electrodes is transparent.Properties of these organic material is analogous to semiconductors. Micro-LED isn't a new display technology, this technology is a solution to the problem faced by panel manufacturers.It helped them to mass transfer and bond million of tiny LEDs in a minimum area.Individual micro-LEDs usually ranges from 1 to 10 μm, and are transferred in large volumes onto the display substrate. MicroLED (µLED) is formed by the integration of light control elements directly with light producing source. This optical component results in a high extraction efficiency and all the light exiting through a single surface of the LEDs.The MicroLED ( µLED) is optimised for flip-chip mounting. This results in excellent heat-sinking of the device and reduced thermal effects in the light source. Above design was patented by infiLED later acquired by Oculus. In their design parabolic reflectors collimates the light and directs it through a single surface of the device. Larger illumination areas can be obtained by densely packing and filling a die with the parabolic structures, effectively giving a MicroLED cluster or LED with all the pixels working in concert. -High contrast ratio. In backlit TFT-LCD panels complete black is not possible.Black is represented by dark grey only. This is because back-light cannot be switched off it completely. But microLED is self illuminating. So pure black can be obtained by switching off the individual micro-LED. This is one of the main advantage of micro-LED displays. -Micro-LED displays will also offer a longer lifespan than current OLED panels. Lifespan of the organic materials used to make the blue OLED is limited. -High response times in the ns (microsecond) range.This feature make them suitable for VR headsets. -Suitable for flexible displays.It's tiny structure can be deposited on a flexible substrate to form flexible display panels. Unlike TFT-LCD and OLED , damage would be minimum on bending or rolling. -Micro-LED panels are expected to be considerably more expensive, possibly three to four times higher than current LCD and OLED panels.This will fall in time, but it will slow down the investments. 2010 onwards , manufacturers are aggressively behind micro-LED display technology R&D. Manufacturers leading in micro-LED patent applications include Apple affiliated Luxvue, Mikro Mesa, Sony, Leti and others. 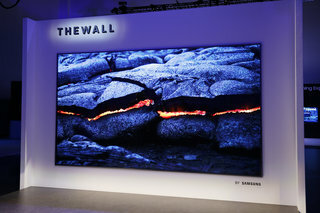 -Samsung unveiled its first MicroLED TV at CES 2018, the 146-inch "The Wall" 4K TV. Commercial launch of large microLED panels would take some time since manufactures have to limit the cost within a limit to make it suitable for consumer electronic devices. -Mass transfer is a critical technology for Micro LED manufacturing, transferring Micro LED to a target backplane quickly and accurately will be one of the topics that manufacturers need to work on the most.